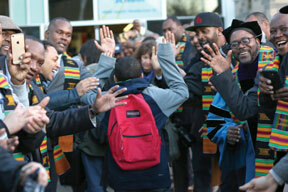 In one of the most dynamic displays of civic engagement seen in Seattle in some time, over 200 Black men gathered at South Shore Pre-K – Eighth School to welcome students to school last Monday morning as part of the school’s Eighth Annual celebration of National African American Parent Involvement Day (NAAPID). NAAPID was founded 20 years ago by Joe Dulin, a retired educator, in response to a call to action (from the Million Man March) by then 12-year-old Ayinde Jean-Baptiste. The day is centered on African American students, but is not exclusive to African American families. Parents, administrators and volunteers at South Shore PreK-Eight have participated in the NAAPID since 2007. This year’s event took an interesting twist as Anthony Shoecraft, a parent and one of the event organizers, had an idea that would change the course of this year’s celebration. That idea was to have 100 Black men show up at the school and engage with the kids. It was both a “what if” moment that took place in a planning meeting and a challenge to see if they could actually pull it off. For Shoecraft, the vision was simple. It was an unapologetic promotion of positive Black male imagery: 100 men of African descent — who are in and from the community — re-presenting a diversity of hues, professions and stories enthusiastically high fiving students as they enter the building to start their day. Shoecraft and the members of the planning committee took up the challenge and put out the call for 100 Black men to show up for the event. The re-ponse was overwhelming, to organizers and participants alike, as over 200 Black men showed up at the school (most of them wearing business attire), ready and willing to stand up and be counted. The goal of the event was to reframe the social and racial narrative concerning Black men by displaying and exposing students to the diversity of Black male excellence, affirm the importance of educational equity by celebrating children and families of African descent, and catalyzing the regional adoption of NAAPID at other schools and school districts and communities throughout the region. By most accounts, mission accomplished. The men began gathering inside the school at 7 a.m., then they formed two lines outside the building where buses and parents dropped students off for school that stretched inside to the building’s rotunda. The event drew Black men from all walks of life including Seattle City Council President Bruce Harrell, Seattle Fire Chief Harold Scoggins, police officers, fraternity members, former athletes, white collar workers, blue collar workers and even some people who work graveyard shifts who came to the event after they got off work.